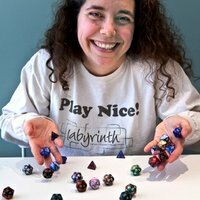 In this episode, Don and Erik talk to Kathleen Donahue from the Labyrinth Game Shop in Washington DC about what they've played lately. (32:41) Next, they answer a listener question and then talk about bring games from the game store to the classroom. This episode is sponsored by Gigamic Games. No matter how you say it, Gigamic means fun. In this episode, Don and Bruce talk to Erik Arneson about what they've been playing lately. (28:10) Next, they are joined by Jason Matthews to talk about politics in games. In this episode, Erik and Isaac talk about what they've played lately. (41:37) Then, Erik and Isaac talk about Mechs & Minions and a few Kickstarters they are waiting on. This episode is sponsored by Gigamic Games. In this episode, Don and Bruce talk to Mike Selinker from Lone Shark Games about games they've played lately. (30:10) Next, they talk about horro games. As a bonus, the boys attempt to set the official world record on mispronouncing the game company Gigamic.